The wrestling world continues to buzz about CM Punk leaving the WWE several weeks before WrestleMania. Now that the dust has settled, fuzzy details are starting to emerge, creating more questions than answers. 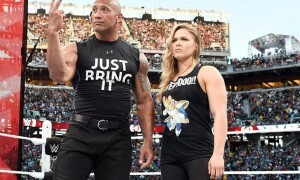 Fans were stunned on Wednesday when it was confirmed that former WWE champion took his ball and went home. The only thing confirmed is that Punk waited until Monday night shortly before RAW went on the air to inform Vince McMahon that he was leaving. 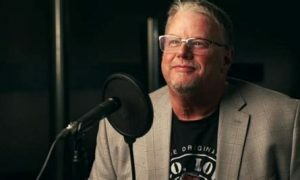 Dave Meltzer does a great job in the latest Wrestling Observer Newsletter and F4Wonline.com podcast of bringing us more details around one of the strangest stories in recent years. Meltzer can’t put his finger on any smoking gun that would have sent Punk over the edge and back to his couch. Meltzer did confirm a few rumors while shooting down other reports that painted a much different picture. Here are some of the highlights of Dave’s report. Punk did not meet with Vince McMahon until 30 minutes before RAW went on the air. Vince was busy re-writing RAW all day and didn’t have time until around 7:30 PM/EST to meet with Punk. Punk had an interview segment scheduled in the show. The reason the Kofi Kingston vs. ADR match was such a long match was that it was extended to cover for Punk’s interview segment. Punk has been burnt out for awhile and frustrated. Many believed that Punk was not re-signing in July. Punk did take a concussion test on Monday but was cleared. An ESPN report indicated that there was an argument between Punk and WWE staff over this yet Meltzer didn’t support that story. Meltzer shot down the report from TMZ.com which stated that Punk left because Batista was headlining WrestleMania. Meltzer didn’t believe it and says that Punk and Batista are friends. Punk even endorsed Batista last week in an interview on the MMA Hour. 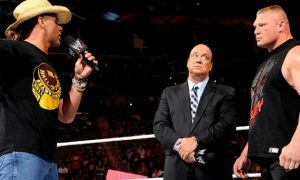 Vince McMahon wants him back and while Dave feels that Triple H does not, Hunter also does not want to be the reason to keep Punk from coming back. Finally, Punk was upset about having to work Triple H at WrestleMania while WWE officials felt it was a big spot for him. Meltzer has a lot more including specific details about these incidents and reports in his lengthy story so I would highly recommend reading the newsletter or listening to his podcast for more specifics. That said I had a few questions of my own after I read Dave’s report. If Punk was planning on leaving why did he take a concussion test? Did something happen on Monday after he was tested that was the impetus for all of this? Was it something Vince McMahon said? Was it the fact that he had to wait until 7:30 to see Vince? It just seems kind of odd that Punk would go through a concussion test to get cleared to wrestle if he wasn’t planning on wrestling any time soon. The Triple H story is a strange one. I don’t think a Triple H vs. CM Punk Mania match was a big mystery to anyone, especially Punk. Just a few weeks ago they had an interaction on RAW that immediately led to speculation on this direction. Quite frankly I don’t know a better spot on the card for Punk other than the title match and he had to know that wasn’t the direction. Nothing has been booked in recent weeks to even tease Punk in the title match so why is this all news to him? It’s not even best for business at this point. I don’t know what else Punk could have done other than the title match that would have been bigger. He also looks quite selfish here considering that John Cena, who is a much bigger draw than Punk has no problem wrestling Bray Wyatt. His timing couldn’t be worse. He has very little leverage here. There is a guy named Daniel Bryan that is ready to slide right into his spot. It isn’t as if the company is going to collapse without him. More importantly, pay-per-view events are moving to the network. What is not having CM Punk on your PPV going to mean in 2014? Buyrates will be of little significance moving forward and Punk wasn’t a big ratings mover anyway. While I know there are plenty of Punk fans that think the WWE will fall apart without him, they will be just fine in their current state. Do I think Punk will be back? I do but not for awhile. I think he lets his contract lapse and makes a play to come back next year and headline WrestleMania. I don’t think you’ll see him at this year’s Mania and while I am skeptical of everything I think this is on the up and up. It won’t be the same without him but much bigger stars than Punk have left and the WWE continued to roll on. I don’t think anything changes here.